Vancouver, BC -- Aben Resources Ltd. (TSX-V: ABN) (OTCBB: ABNAF) (Frankfurt: E2L2) (the "Company") is pleased to announce the receipt of the finalized data from a ground-based induced polarization geophysical survey that was conducted in June 2017 on the 4,657 hectare Chico Gold Project located 125 kilometres east of La Ronge, Saskatchewan and 40 kilometres south of SSR Mining's (formerly Silver Standard Resources) Seabee gold operation. Aben Resources holds the exclusive right to earn an undivided 80-per-cent interest in the property by completing $3.5-million in exploration expenditures, issuing 2.5 million shares and making $150,000 in cash payments to Eagle Plains Resources (TSX-V: EPL) by 2020. Aben recently made a cash payment of $25,000 and issued 250,000 common shares to Eagle Plains, pursuant to the terms of the current option agreement. Aben intends to carry out diamond drilling on the Chico property in late February. Permitting and detailed planning for the program is currently underway. 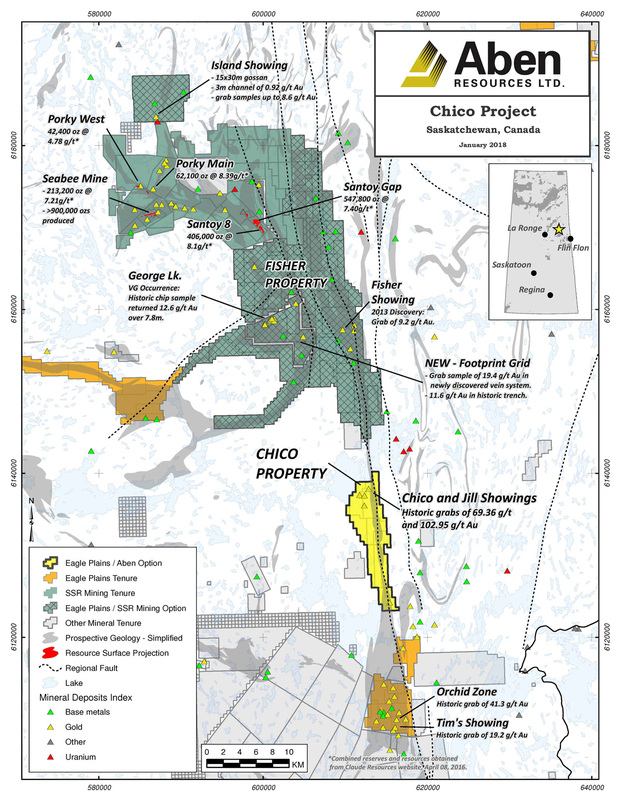 Chico drilling activity is expected to be conducted concurrently with a 10,000m winter drill program to be carried out by SSR Mining Inc. on Eagle Plain's Fisher Property, located 6km north of Chico. The 2017 geophysical survey has discovered a large high-chargeability zone centered below the middle portion of the Chico shear zone with some vertical chargeability structures extending upward from the root zone. The high-chargeability response may result from the presence of abundant sulfide minerals such as pyrite, pyrrhotite and chalcopyrite, which are closely associated with gold mineralization on the Property. The top of the root zone appears to extend to within 150 metres of the surface and represents an attractive and high-priority drill target given that multi-gram gold intercepts have been historically reported above and adjacent to it. Of the 22 historic drill holes located on the Property, the deepest has reached 110 metres vertical depth (157 metres down hole) and was not collared in this zone of high chargeability. Two short videos depicting the zone can be viewed here: https://www.youtube.com/watch?v=vQPSgr-g0Vg and https://www.youtube.com/watch?v=zBen-X8HFzI. Exploration programs in 2016 and 2017 involved systematic fieldwork including a 661 line-kilometre airborne magnetometer geophysical survey, mapping, trenching, soil geochemical analysis and the aforementioned ground-based IP-Resistivity-Magnetic survey. The systematic exploration has enabled field crews to identify mineralization, alteration and structural features similar to those at the nearby Seabee and Santoy deposits, located 40 kilometres to the north. The Seabee Gold operation has been in continuous production since 1991, producing 1.2 million ounces of gold from the two deposits. Seabee and Chico are comparable in that mineralization is spatially related to splays of the Tabernoor Fault and are hosted in sub-parallel shear structures which cross-cut the local intrusive complex. High-grade gold mineralization at both Seabee and Santoy extends well below the shallow depths to which the Chico Project has thus far been explored. Aben Resources is a Canadian gold exploration company developing gold-focused projects in British Columbia, Saskatchewan and the Yukon Territory. Aben is a well-funded junior exploration company with approximately 62.7 million shares issued and outstanding. For further information on Aben Resources Ltd. (TSX-V: ABN), visit our Company's web site at www.abenresources.com.